There is no lack of interesting places to visit in Jamaica. St. Elizabeth is blessed to be the home of many of them. If you like beautiful scenery and you're wondering where to go in Jamaica, a country known for its beauty, don't miss these spots. On the very edge of the Santa Cruz Mountains, from a place called Lover's Leap, you can see heaven and earth meet. 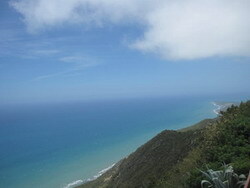 The mountains plunge into the sea of Jamaica's south coast from a height of over 1000 feet. The blues are so intense and intertwined that it's hard to tell where the sea stops and the sky starts. Lover's Leap is located at Yardley Chase, near Southfield. There's a small entrance fee, and a restaurant on the property whose balcony provides a fantastic view. The legend of Lover's Leap is one of the best known Jamaican folk tales. As with many Jamaican stories, parts of the tale are probably factual. According to the story, two young slaves were in love. They used to meet in secret at a property near Lover's Leap. Their owner wanted the girl for himself, and arranged to have her lover sold. Getting wind of the plan to separate them, the two tried to escape. The master gave chase, and they fled to Lover's Leap. Preferring death to capture, they jumped hand in hand over the cliff. An old woman watching saw them jump, but said they did not die. The moon caught them in a shining net and pulled them up. They were last seen holding hands on the moon as it descended into the sea. Located on the main road between Middle Quarters and Lacovia, Bamboo Avenue is a terrific place to stop and have an ice cold jelly coconut, on sale by the roadside. Or some great Roti and Curry from the little restaurant near the school. There's no sign on the shop, so look out for it next door to the school. Be careful of the 50 km/hr speed limit in that vicinity. I speak from experience. 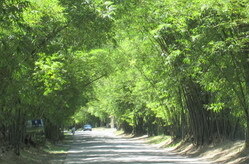 It is thought that the beautiful bamboo canopy was planted in the late 19th century for the purpose of supplying material to the nearby Lacovia Manufacturing Company. The bamboo fibre was used as a lubricant for car wheels and steamship engines. The enterprise did not last, but happily the bamboo has survived. A morning visit is really lovely, especially when there's been rain in the preceding days. Everything looks fresh and crispy, and there is less of a chance of rain than in the afternoon. During and after our wettest months, May and October, the bamboo gets extremely green and thick, and puts on its best show. Middle Quarters, the Pepper Shrimp capital of Jamaica, is a few mintues drive away. If you love spicy food, there's nothing as scrumptious as these "swims". An update - I'm sorry to report that Fonthill has been closed to the public since the start of 2013. I'll leave my description in place in the hope that it will reopen soon. Growing up, Fonthill Beach was one of our family's regular hang out spots. At that time there was just the beach, and a whole lot of bush on the trail leading there. Now it's more civilised, with shower and changeroom facilities, bar and snack counter, covered picnic areas, and lifeguards. It's one of the popular Jamaican beaches, and draws groups from all over the island. I visit regularly with my family, but never on a public holiday as it tends to be very crowded. It's a lot more peaceful on weekdays (not open on a Monday, though) and in the mornings. Fonthill is not a very large beach, but it's very pretty, and there's a reef where people go snorkelling and spearfishing. You have to bring your own gear. Occasionally you may find that there's not a lot of sand on the beach. This sometimes happens after a patch of bad weather, when the tide gets really high and steals the sand away. At that time, I'm told, the water by the reef gets very shallow, as the sand ends up there. In a few days the sea finds its conscience and returns the sand to the beach. But even on those days when the sand is on vacation, Fonthill is still great for swimming, and you can hang out on the patio or the lawns when you're not in the sea. Fonthill is about 15 minutes drive from Black River. It is close to the border of St. Elizabeth and Westmoreland. For the environmentally conscious, the Font Hill Wildlife Sanctuary is nearby - you can only go if a guide is there to accompany you, which is not always the case. Check out Pelican Bar, a hang-out spot in the middle of the sea. 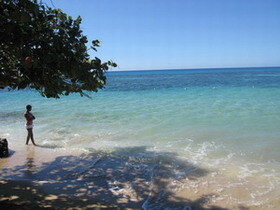 For other great places to visit in Jamaica, see this page on St. Elizabeth.